The first proof of concept. Originally force-input / motion – feedback. It was with this system that I discovered that all actuator motion had to be in relation to a proximal relative base. The third prototype. This used resistive force sensors and vibrotactile feedback. The feedback was provided using voice coils, which were capable of full audio range, which meant that all kinds of sophisticated contact and surface effects could be provided. That proved the point that 5 fingers could work with vibrotactile feedback, but the large scale motions of the base seemed to need motion (I’ve since learned that isometric devices are most effective over short ranges). This was also loaded with electronic concepts that I wanted to try out – Arduino sensing, midi synthesizers per finger, etc. To Get 3D interaction, I took two FS/VO modules and added them to a Phantom Omni. I also dropped the arduino and the synthesizer and the Arduino, using XAudio2 8-channel audio and a Phidgets interface card. This system worked very nicely. The FS/VO elements combined with a force feedback base turned out to be very effective. That’s what became the basis for the paper, and hopefully the basis for future work. Project code is here (MD5: B32EE89CEA9C8E02E5B99BFAF24877A0). This entry was posted in C++, DirectX, Electronics, FLTK, Haptics, Hardware, OpenGL, OpenHaptics, Sound on October 11, 2013 by pgfeldman. I was just asked to see how many hours I have left for working this research. It turns out at the rate I’m going, that I can continue until mid-October. This is basically a big shout-out to Novetta, who has granted a continuation of my 20% time that was originally a hiring condition when I went to work for Edge. Thanks. And if you’d like a programming job in the DC area that supports creativity, give them a call. Fixing the state problem. Done. Fixing the saving issue. Also changing the naming of the speakers to reflect Dolby or not. Done. New version release built and deployed. I started to add in the user interface that will support experiments. Since it was already done, I pulled in most of the Fluid code from the Vibrotactile headset, which made things pretty easy. I needed to add an enclosing control system class that can move commande between the various pieces. I’ve also decided that each sound will have an associated object with it. This allows each object to have a simple “acoustic” texture that doesn’t require any fancy data structure. At this point, I’m estimating that the first version of the test program should be ready by Friday. This entry was posted in C++, DirectX, FLTK, Haptics, Hardware, OpenGL on August 19, 2013 by pgfeldman. Adding custom speaker number and placement as per Dr. Kuber’s request. Done! With only a couple of string compare issues. I also had to make the speaker index jump around the subwoofer channel until I can work out how to set the EQ. And it looks like there are bugs in the code. It seems that you cannot do zero speed sessions. And the writing out of results with multiple sound files looks pretty confused. I’m not sure if extra CRs are being put in there or if some of the data isn’t being written out. Need to run some more examples. This entry was posted in C++, DirectX, FLTK, Sound on August 16, 2013 by pgfeldman. Need to calculate individual forces for each sphere in the Phantom and return them. Done. To keep the oscillations at a minimum, I’m passing the offsets from the origin. That way the loop uses the device position as the basis for calculations within the haptic loop. 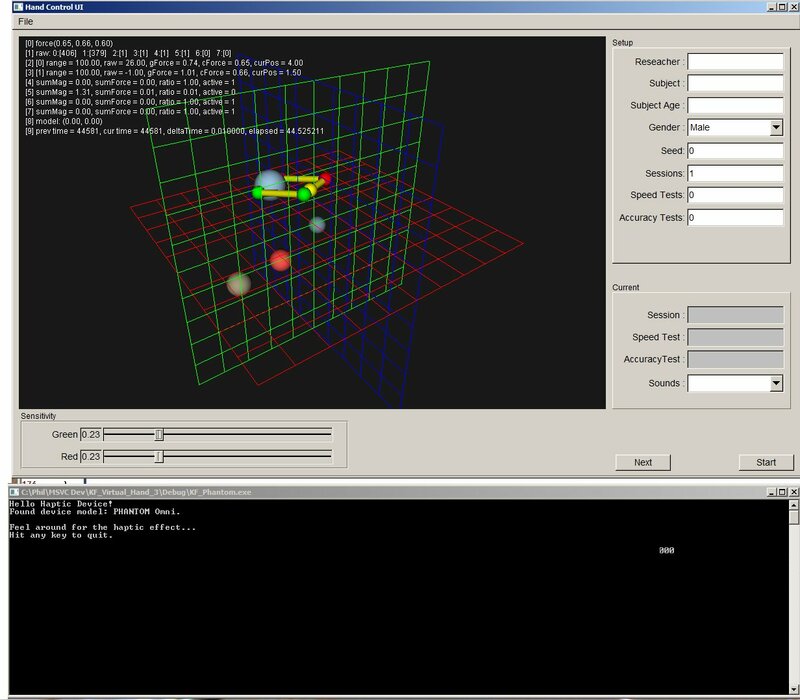 This entry was posted in C++, DirectX, OpenGL, OpenHaptics, Sound on August 8, 2013 by pgfeldman. Probably only use two actuators for the simplicity of the test rig. It would bean that I could use the laptop’s headphone output. Need to test this by wiring up the actuators to a micro stereo plug. Radio Shack tonight. Got two-way communication running between Phantom and sim. Have force magnitude adjusting a volume. Added a SimpleSphere class for most of the testing. This entry was posted in C++, DirectX, OpenGL, Sound on August 6, 2013 by pgfeldman. 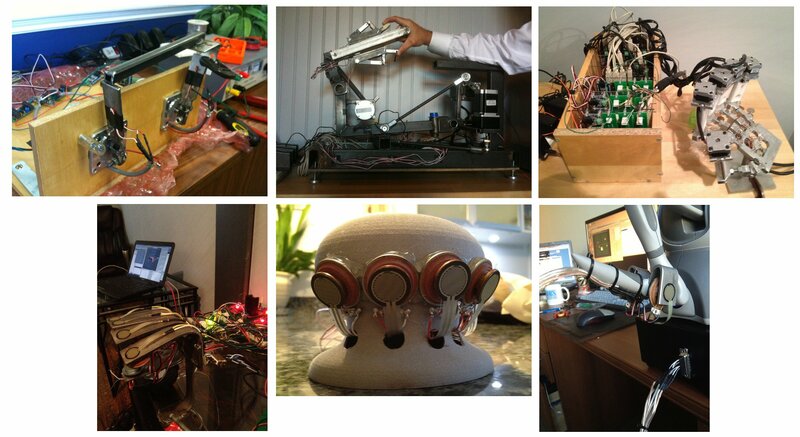 Got a bunch of items to add actuators to: Hardhat, noise-blocking headphones, and a push-to-talk mic. Added a ‘next’ button. Once pushed, the sources can show until the center is clicked again. This entry was posted in C++, DirectX, FLTK, Sound on July 3, 2013 by pgfeldman. Continuing with the test exec. I’m also going to need a class that records the data associated with each test segment. I mean really!? Good grief. Got a lot of the exec built and running. Clicking on the center button fires the sound, and you can drag to where you think the sound is. I am not all that accurate. It could be a frequency thing though. I’m running a low 10-20 HZ signal. The test should definitely try different frequencies. This entry was posted in C++, DirectX, FLTK, Sound on June 25, 2013 by pgfeldman.